We have at last found them! Stainless steel food dehydrators. Each and every stainless steel dehydrator is either built or assembledand inspected in entirety in Buffalo, NY. So you know you are getting the highest quality when you order one of our food dehydrators. 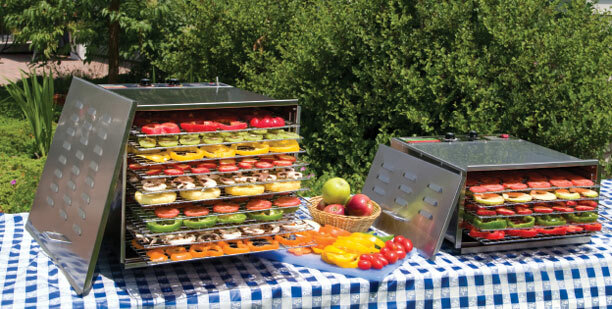 The dependability and versatility of every unit makes these dehydrators invaluable for anyone that enjoys real jerky, dehydrated fruits or vegetables, making their own bread crumbs or even potpourri. Whether you follow a Raw Food diet, are turned off by the plastic dehydrator alternatives or want to make some delicious snacks, you're on the right page! 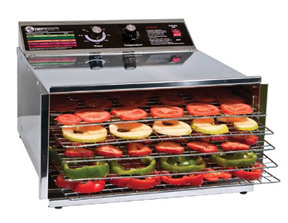 The D-5 Food Dehydrator features a side mounted fan and louvred door to maximize air circulation and moisture removal. A temperature control and timer take the guess work out of drying food in our D-5 Food Dehydrator. A detachable back panel and shelving unit make this food dehydrator especially easy to clean. • 304 Series, 22 ga Stainless Steel construction - Food Grade, Won't rust! • Comes with 5 Stainless Steel Shelves, 16 1/4" x 14 1/2" with 1/4"